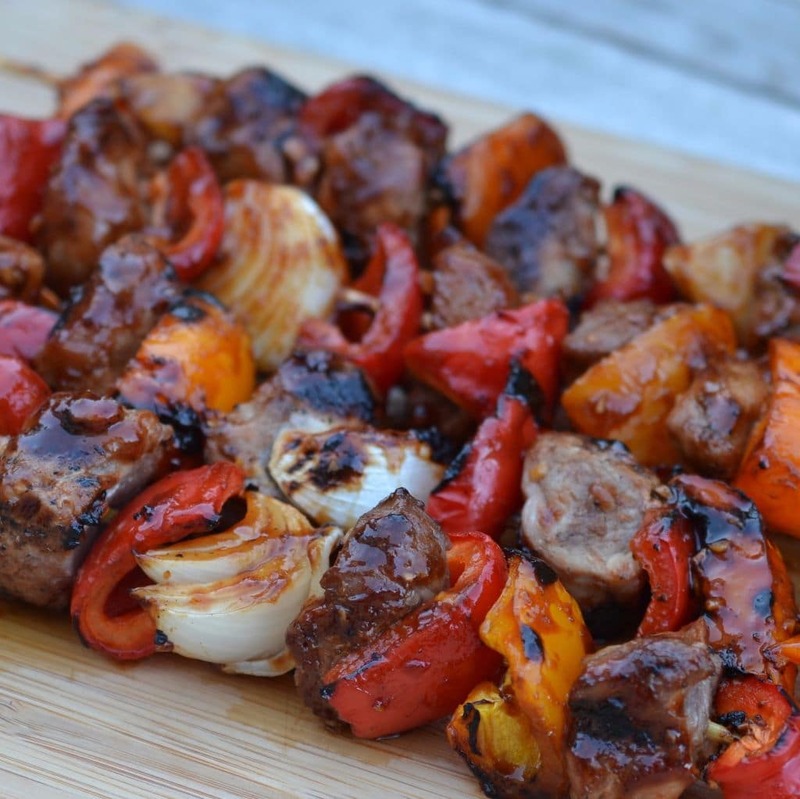 These spicy pork & pepper shish kabobs are a must have recipe. They are easy, remarkably dependable and totally delectable. 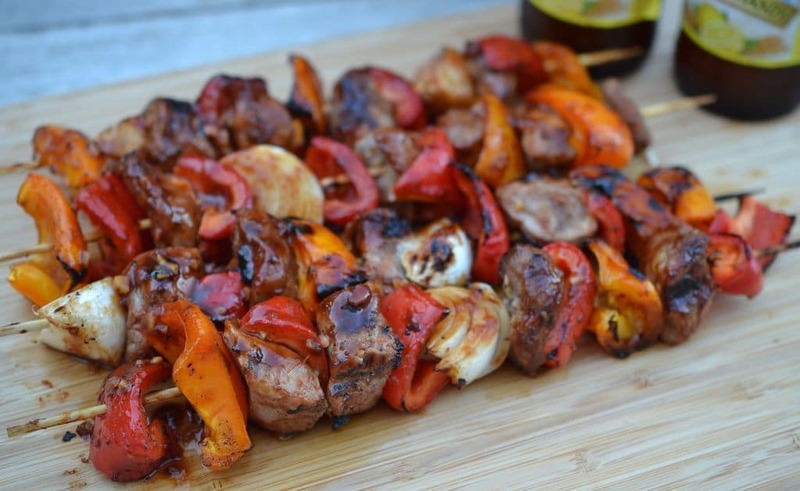 The sauce can be prepared in a matter of minutes and it combines the flavors of brandy, garlic, soy, mirin and sriracha to give these kabobs the right amount of savory and spice. It might just be the thing you need to add a little romance into your dinner. You might find your honey all spiced up!! Look at that. Now who could resist it! It is absolutely irresistible served with some angel hair pasta or basamati rice. Serve any extra sauce you have on the side. Now, now, now no licking the sauce pan! Bon appetit my food loving friends! Combine pork tenderloin, red wine vinegar, 2 tablespoons soy sauce, 2 tablespoons worcestershire sauce, 1 tablespoon mirin and 1 clove garlic minced in ziploc bag. Marinate for 45-60 minutes. 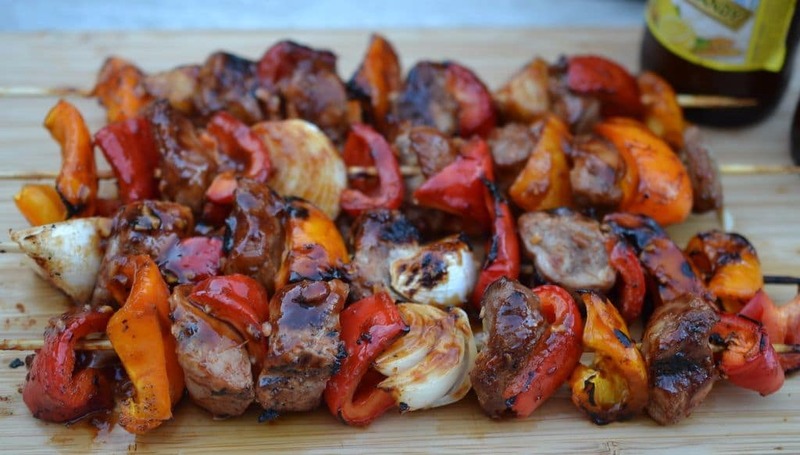 Thread skewers with orange peppers, red peppers, onions and marinated pork. Combine brandy, 1/4 cup soy sauce, 2 tablespoons mirin, sriracha, 1 tablespoon worcestershire sauce, ginger, BBQ sauce, and 2 garlic cloves minced in small saucepan. Simmer over low heat until fragrant approximately 10 minutes. Preheat grill and cook over indirect heat for 4-5 minutes each side. Marinating with the sauce every 2-3 minutes. Remove from grill and allow to rest covered for 10 minutes. Serve with extra sauce.